There are some standard capacitor values that have developed over time. To find the value you need for your circuit you need to know how to deal with prefixes. And you need to know how to calculate capacitor values. If you have looked for capacitors, you have probably seen many different letters and weird values. Like 0.47 or 22 pF. It is a bit confusing, but it’s easy to learn what it means. In this article you will learn the most standard capacitor values, the prefixes used and how to calculate a capacitor value for your circuit. Capacitor values are given in Farad. The symbol used is F. It’s named after the English physicist Michael Faraday. But 1 Farad is pretty big. So capacitor values are usually given with a prefix. 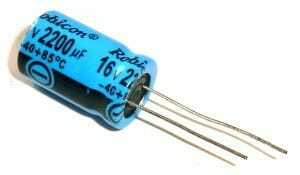 Often you are going to work with capacitors values in pico-farads to micro-farads. To make this simpler to deal with, I’m going to show you how the prefixes work. Which Capacitor Values Are There? How Do You Choose Capacitor Values? This constant gives you the time it takes for a voltage in an RC circuit to go from 0% to 63% of its full value. You can use this time constant to calculate the cutoff frequency in a filter, or just how long a delay will be in a blinking light circuit. So to get a cutoff frequency of 15 kHz, we need a 1k resistor and a 11 nF capacitor. To make everything more confusing, capacitors come in many different types. I have written a simple guide on how to choose a capacitor type that you should check out. There is no need to memorize these things. Just bookmark this page and you’ll have easy access to it later on. When you have used the prefixes and the formula enough times, you will automatically remember them. I am trying really hard to understand what’s on the page, but it’s really hard to when all the pictures aren’t loading. I don’t know what’s happening. It only happens on this one. I was wondering about the RC time constant. What is R and what is C? So far capacitors really have me confused about whats what. R is resistance given in Ohms. C is capacitance, given in Farads. Think about it like filling a container with water. The capacitor stores electrons. A resistor in series with the capacitor will impede the flow, extending the time it takes to reach full capacity. if i need a 400V capacitor, can i use 350V or 450V capacitor instead of 400V. 400 volt is how much voltage the capacitor can handle. So you want 450V at least. Is there a minimum value of voltage that a capacitor can work with? No, there isn’t any minimum voltage. I would like to introduce the application of a capacitor to the kids and I think a simple windmill project should be the best example to highlight the application. I need a small capacitor in a simple electric circuit of a self-made windmill. I am going to use 2 x 1.5v battery for the project. Appreciate your advise on what type of capacitor to use for this project as I do not know how to choose one. Thank you. It’s difficult to say without knowing more. What is the purpose of the capacitor in this application? Hi, I seriously don’t know what page mean can you give a simpler explanation of all his page means like starting from the prefixes and the calculation. Hi , sorry about the typo above. I was saying that can you give me a simpler explanation at this page I don’t understand what the prefixes and the calculation means. Prefixes are an shorter way to write numbers. For example “kilo” means 1000 and uses a “k” as a symbol. This means instead of writing 10000, I can write 10k. What is the table from rfcafe.com for? And what is the use of knowing this? Is it if we know how to calculate then we know which capacitor will be the best in our circuit? Then the table from rfcafe.com for? 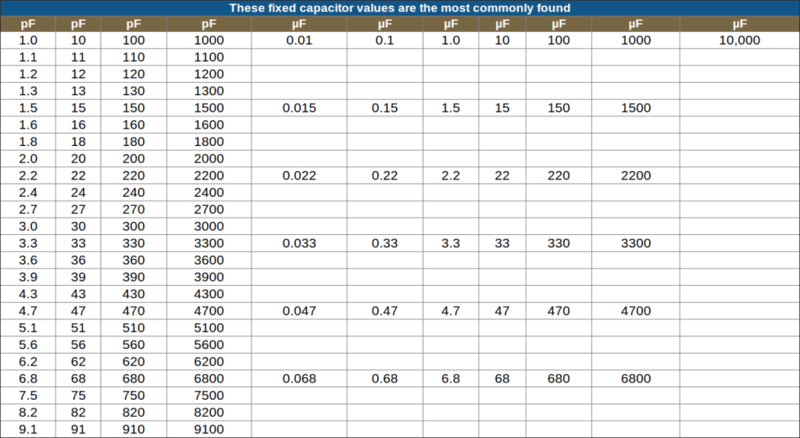 It shows the most commonly found capacitor values. If you for example have calculated that you need a capacitor of 17µF, you can check if that exists in the table. Since it doesn’t you have to find another way of doing it or go with one of the values that are listed. Can I know what is the symbol equal to R * C? And please explain what it mean. Hi, can I know the part of “how do you choose capacitor values” in this page. What is the equation of that first symbol before equal R times C? And also explain what did it mean? Is it voltage? It’s called “tau”. It’s the time constant. This constant gives you the time it takes for a voltage in an RC circuit to go from 0% to 63% of its full value. please can you explain what cut off frequency means.i tried google searching but i got confused even more. i love your writing style though….keep up the good work! In a low-pass filter for example you only allow frequencies below the cutoff frequency to go through. Hi, in your exemple, how did you end up with 15 000Hz that’s the only part I don’t get. I don’t know what a low-pass filter is could you explain? I’m asking because I want to make a hand crank flashlight using a 6V and 0.04A Dynamo, 3,1V LEDs, an interupter/switch and a capacitor but I don’t know which capacitor to choose. So I would like to figure it out. For your project, you don’t need a low-pass filter, so just ignore that part. It’s hard for me to say anything about the size you need since I don’t what you are using the capacitor for. Ah ok, I understand. Capacitors normally store very little energy. But you should look into super capacitors. They can store more energy. I’m trying to repair the power supply circuit in a transceiver that I have. I know I need a 3300 uF 70 VDC electrolytic capacitor, but every time I go to a website to FIND one, I’m also asked what tolerance I need, ripple current, ESR, ROHS compliant,etc. Do I need to worry about these values or not? The most important for you is to find a capacitor that has 3300 µF and a voltage rating of 70V or more. Don’t worry about the other stuff. if I want LED 3V blinking once per second, using this scheme, but the input voltage is 9v, what are the values for R and C. If you can write formulas and how you got those results. Thank you. I don’t know which circuit you are referring to. There are no blinking LEDs in this article.. I think the circuit from the text above, if I put on the output LED 3V and input voltage of 9V. Back,25yrs ago as a technical student course my freshman/soph. Yr. I really enjoyed electronics, never could afford all the highends and newer technology tht aspired thn…so the course helped me with tht, made a few dollars here and there as well as i was trying to fix every car stereo, with missing plug and solder my own pig out ..and burnt units.. (lack of sense, of most..) dollars was my lack so stayed close to those fools lol…amps were ALWAYS just a burnt curcuit…quik soldered jump wire and i was in there. I would b bumping to it same day…sry carried away for sec, i ended up going a whole nother direction. i want to use a capacitor for my 125cc local motor cycle!!! for increasing my illumination when i travel at night! and at d same time for helping my batt life…! sir how to calculate of capacitance that i need in d future? Hi, what can I replace a 78 faret ceramic disc cap with? The application is in a tv power supply circuit. The value on the cap is u78Z . Ceramic disc caps are very easy to find, so just replace it with another one. Hi please help! Let say I am required to select a capacitor value of 5.8nF for my circuit, but the only available capacitors in my workshop are 6.8nF and 4.7nF. Which value should i choose? Hi, that depends on what it’s for. If you don’t know the calculations just pick one and see if it works. If it gives you a bad result, try the other one. micro farade,it’s voltage rating,and if needed it’s charge. How to calculate and figure out exact value capacitor we need? eeeeh am give Resistor as 100ohms , capacitor as 10ohms , inductor as 10ohms and de supply voltage is 200v ……plz help on hw to calculate de value of capacitor nd inductor …!!! I have a circuit board that I want to repair but 3 capacitors have blown and were taken out of the board so I have no reference. Is there any way of knowing what capacitors I can use to get the board running? No, I do not have a schematic. There are ways to make a good guess at least. First of all – what type of circuit do the capacitor belong to? A microcontroller circuit, connected to the power pin of the microcontroller? Often 100nF. Connected to some kind of component with writings on them? Find the datasheet of the component and see if the datasheet tells you anything about its capacitors.